Lynn Hershman Leeson pioneered site specific, performance and interactive media. Most recently, she was honored by the Digital Art Museum in Berlin with the d.velop digital art award (d.daa), the most distinguished honor for lifetime achievement in the field of new media. Her other honors include the prestigious Golden Nica Prix Ars Electronica, the ZKM/Seimens Media Arts Award and, as a Sundance Screenwriter Fellow, she was honored with the Flintridge Foundation Award for Lifetime Achievement in the Visual Arts. She has also received The Alfred P. Sloan Film Prize for writing and directing Teknolust, and in 2006, the International Association of Digital Arts award for “innovative storytelling,” Zero One Prize for “Media that Matters” and a Creative Capital Grant for her documentary, !Women Art Revolution. In 2009, she became a Guggenheim Foundation Fellow and received a Lifetime Achievement Award from Siggraph. Hershman Leeson wrote, directed and produced the feature films Teknolust, Conceiving Ada and Strange Culture, in addition to 14 other films and shorts. The films starred Tilda Swinton, were shown at the Sundance Film Festival, Toronto International Film Festival and Berlin International Film Festival, and were all internationally distributed. Her artwork is held in numerous collections, including at the Museum of Modern Art (New York), The National Gallery of Canada, DG Bank (Frankfurt) and The Walker Art Center (Minneapolis). She has published extensively, is the Chair of the Film Department at the San Francisco Art Institute and Emeritus Professor at the University of California. 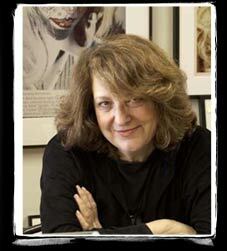 Lynn Hershman is represented by Paule Anglim Gallery in San Francisco and Bitforms Gallery in New York. Sarah Peter is an artist whose work is in many collections worldwide. She has been an active philanthropist for many years, focused primarily on mental health and women's issues, and has given critical support to the Women's Institute at Omega, The Museum of Modern Art and other cultural institutions. Kyle Stephan is a film producer, fundraising consultant, and programmer. Recently, she joined the development team at Film Independent, the home of the Los Angeles Film Festival and the Independent Spirit Awards. She serves as consulting producer on Lourdes Portillo’s forthcoming narrative debut The House on Mango Street, based on the bestselling novel by Sandra Cisneros. Stephan is also an active film programmer who has programmed for numerous international film festivals and arts organizations, including the São Paulo Museum of Modern Art, San Francisco Cinematheque, Outfest, the São Paulo International Short Film Festival, and the British Film Institute where she has worked as a seasonal programmer since 2005. Alexandra Chowaniec is visual artist creating oil paintings that conceptualize the human figure within contemporary visual culture. She is an MFA graduate from the San Francisco Art Institute and received her BFA Honors in Painting from Queen’s University in Canada. Her work has been exhibited internationally, including at the Galerie d’Art Jean-Claude Bergeron and Wall Space Gallery in Ottawa, Canada, and The Lab, Art Engine Gallery, and The Diego Rivera Gallery in San Francisco. She was awarded the Irene Pijoan Memorial Painting Award, the Helen Nininger Memorial Scholarship in Fine Art and is a Joan Mitchell Foundation Fellowship Nominee. Her work has been published in New American Paintings, the Ottawa Citizen and the San Francisco Chronicle (online edition). Carla Sacks has twenty years experience in the arts and entertainment field. A graduate of The Henry Grady School of Journalism, she started her own PR firm, Sacks & Co., in New York City 15 years ago. Throughout her career she has developed and executed PR plans and strategies for many of the most critically-acclaimed artists, filmmakers and entertainment companies, including Bjork, Dolly Parton, Emmylou Harris, David Byrne, Julian Casablancas, Sufjan Stevens, John Mayer, Buena Vista Social Club, Starbucks Hear Music, the (RED) campaign and NPR Music. Newsweek ranked her former group, Sleater Kinney as the #1 Rock Group in America. She currently writes a blog for NPR and is working on a book of music memoirs for Harper Collins due for release in 2010. Laura Blereau is a New York based curator and writer whose other recent projects include “Spazialismo” at bitforms gallery and “Second Line” at Ad Hoc Art. She holds a masters in new media, video and performance from Pratt Institute. Her BFA was earned at Louisiana State University, where Blereau pursued painting and radio. Gracie Bucciarelli is a filmmaker and editor whose short films have screened in numerous local and international festivals. Her background and influences include performance theater, commercial fishing, and plants. Gracie was a co-curatorial Big Ballyhoo collective member awarded an NEA creativity grant for Inside of Inside, and is an Osher foundation recipient who received a BA with Honors in Film and Intermedia Art from Mills College. Gracie lived in the Pacific NW for three decades, watching nature and industry grow underneath that grayscale she always believed to be a primary color. This is one reason Gracie enjoys black and white film. Michella Rivera-Gravage is an artist, bringing together both old and new media to tell personal and public stories. Her work employs locative and social media to create participatory and distributed projects. She is currently working on an animated web series entitled MAHAL MARITES. Michella is the Director of Digital Media at the Center for Asian American Media (CAAM), where she oversees all new media projects. Since the late 60s Ariel Dougherty has been a catalyst within feminist media and cultural communities: In 1969 she co-founded Women Make Movies; she was the initiator of TARTS – Teaching Artists to Reach Technological Savvy (1984 – funded by Apple Computer); director/producer, From the Interior, Colonized (1992) featuring Vandana Shiva as women from across the globe devised biodiversity policy in advance of the Earth Summit; presently she advocates vastly greater resources for feminist gender justice media via Media Equity Collaborative. Jan Zivic co-founded vibrantBrains, an organization providing a brain fitness community for people dedicated to improving their cognitive skills with scientifically developed cognitive exercises. Jan has served as President of several San Francisco community Boards, including the Yerba Buena Center for the Arts and was a Member of the Board of Directors of KQED. She has been honored at the San Francisco Cable Car Awards as “Woman of the Year” for Community Leadership and Service and received the Maya Angelou Award for Excellence from the UCSF Women's Health Center. Please click here for the complete !W.A.R. credits.